Magical Jelly Bean offers an Open Source dictionary that can be stored on a USB device. 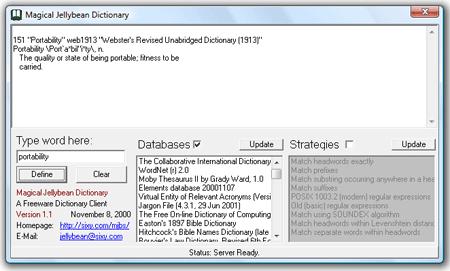 The portable ditionary does need to connect to a dictionary server to retrieve definitions from the database on the server. In order to use the portable dictionary, the user does need to have internet access. However, having the ability to access the definition for any word, no matter where you are, makes this portable application well worth the free price. 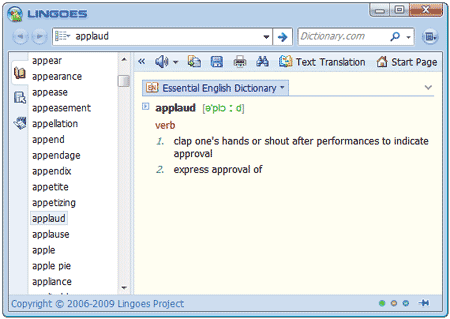 Lingoes Portable is both a portable dictionary and portable text translation software. It features a complete dictionary and can translate text and pronunciation of words in over eighty different languages. Simply unzip it into USB Flash Drive and run it wherever you have access to a PC. Lingoes is a great Portable Dictionary to use in school, at a cybercafe, library and more.